Notes and sounds appeal to us, whatever the era or culture, they awaken memories and make our heart and spirit vibrate. From ancient times, man has sought to announce the hour with a sound signal. Certain clocks or pendulums were equipped with chimes, gongs or balls that would strike a note. Starting with two sound complications, the idea was to orchestrate a joint production worthy of Perrelet’s dynamism and aestheticism. A bold challenge taken up by Perrelet who, harnessing technology and applying its precious talents to the development of its distinctive characteristics, revolutionises the conventional watch box and thus the “MAESTRO EDITION by Perrelet” is born. 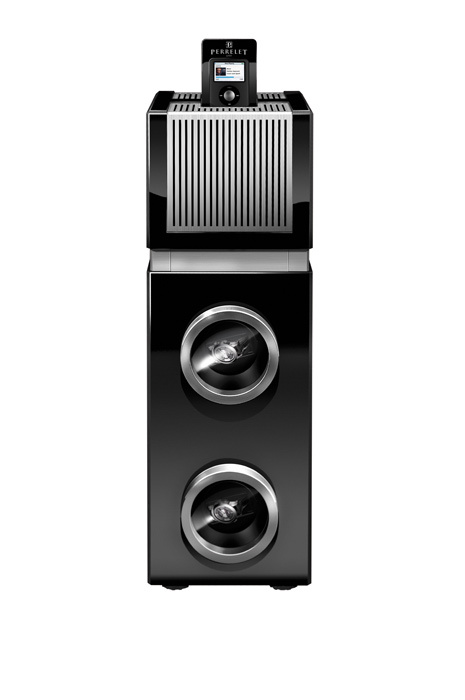 A superb tower: black lacquered wood, aluminium fluting, two mysterious glass portholes and on its top a retractable card. Upon selecting this card, a base appears, but it is above all the signature that attracts one’s attention, that of the brand recognised as belonging to: the inventor of the automatic movement. At this point, a secret drawer opens, activated by simple pressure, housing the iPod nano with its remote control. 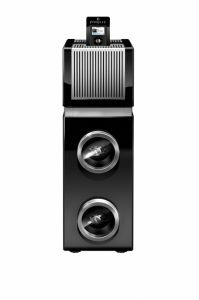 The listener will have the pleasure of living a new sonic experience, thanks to an amplifier and loud speakers, which reproduce a sound of a crystalline purity with wonderful deep bass tones. With one’s senses awakened, our eyes, eager to discover, continue their search and soon notice the two windows framed in brushed aluminium. 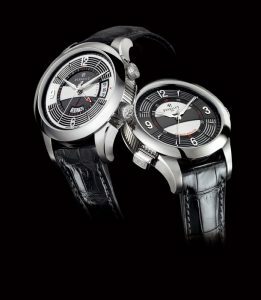 These are hiding two Perrelet timepieces displayed on an ingenious rotating winding system. Accessible both from the front as well as the back, the complications are waiting without losing a minute of the time passing. 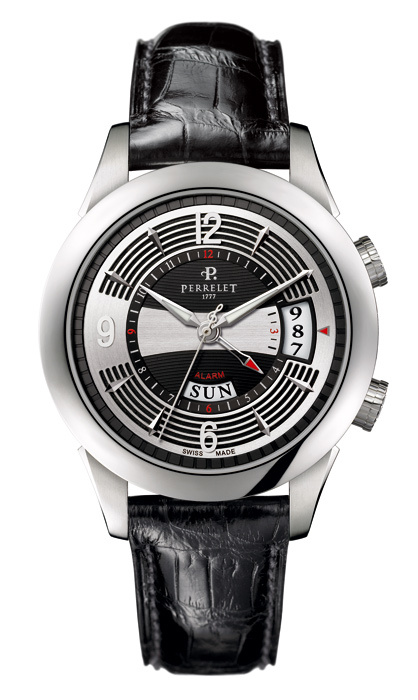 The first, an automatic 5-Minute Repeater, with hours, minutes and central seconds. 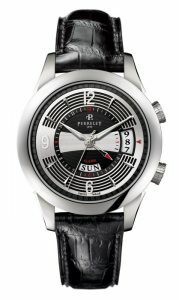 Equipped with a calibre P-201, this 5-Minute Repeater, through simple pressure on the push-piece positioned at 8 o’clock, sets off the sound mechanism “on demand”. A first deep note sounds the hours. A succession of double notes, high and low, hammers each five minutes. Like a musical instrument, the resonance is the key of the melody emitted, which is amplified by the convenient openwork of the case, producing a higher volume than a classic case. 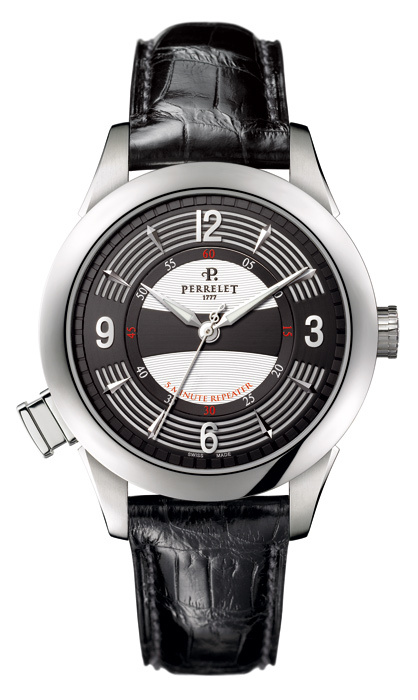 The second complication is an Alarm, in which the Abraham-Louis Perrelet invention plays a double role. The P-121 calibre is equipped with two barrels both housing a mainspring which store the energy. Thus, the oscillating weight charges the energy for the sound function in one rotational direction, and for the basic functions in the other direction. This timepiece, apart from its basic functions of hours, minutes, central seconds, day and date, enables its wearer to benefit from a sound alarm at any moment in the day, without having to wind the mechanism manually. A stainless steel case houses these two automatic complications. The brand’s distinctive fluting makes them easily identifiable and recalls the fluting on the column. 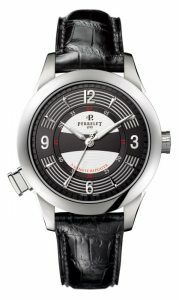 The pushers with their double music notes reflect the high qualities of visible and intrinsic finish imposed by Perrelet. A shiny black croco bracelet, topstitched in grey anthracite, completes the outer features. Observers will recognize the many musical symbols on the dials. A broad wave divides the dial into two parts, containing Arab numerals and rhodium-plated indexes. A line of piano keys surrounds the outer ring, while the sound beats are signalled by a seconds hand whose counterpoise takes the form of a treble clef. Both complications share a single musical design, their only difference being their contrasting effects. Black dial on a rhodium background for the 5-Minute Repeater, and rhodium on a black background for the Alarm watch. Both complementary, the one cannot do without the other. Perrelet displays them together in this incredible concept, which reflects the personality of its owner. With the skill and versatility of an orchestra conductor, Perrelet awakens the senses and the memories. Let yourself be immersed in the intense feelings aroused by classical music.Allow yourself to be engulfed by generous oriental melodies or swept along on the rhythm and sensuality of Latin notes.